In December 2014, Disney unveiled a trailer for what would become the latest movie in the Star Wars suite of films. In it, fans were blown away with the unveiling of the crimson cross-guard blades of Kylo Ren’s Lightsaber. Discussion was sparked across the internet, and a fire of both applause and criticism rolled through cyberspace. What fans didn’t realize on that day was that the most controversial saber was yet to be unveiled! Its blade first ignited on screens in 1977 when Obi-Wan Kenobi bestowed the legendary saber upon Luke Skywalker, and marked the beginning of the galaxy’s greatest saga. The blue blade of what has become fondly known as The Graflex (named for the parts of the camera from which it was first constructed), has been passed through more hands (ba-dum-tiss) and has been seen on screen far more than any other Lightsaber in the Star Wars story. It has been wielded both to defend the Light Side of the Force, and to shatter all hope as the Dark Side rose to power. Now, through intangible and unpredictable fate, the Lightsaber constructed by Anakin Skywalker all those years ago has found its way back to its rightful successor. In an attempt to follow the blade’s journey, YouTuber Christopher Sherwood has compiled each scene through the saga in which the weapon appears, from The Phantom Menace, to The Force Awakens. 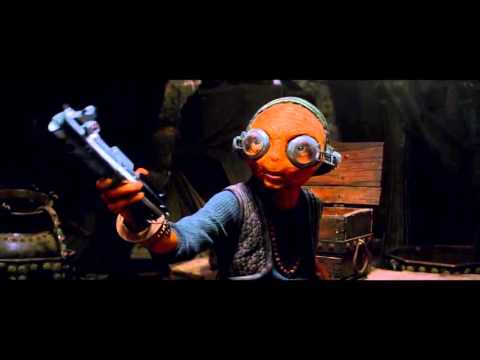 Check it out below, and help us answer the one question still on everyone’s mind: How did Maz Kanata wind up with it?